What are the specific allergens found in latex examination gloves and what symptoms should I look for? It is estimated that over 10 billion latex gloves are purchased and used in the United States each year. In addition, there is also an estimate is that approximately two to six percent of all people are allergic to latex. This could include patients, as well as medical professionals. Latex is found in a variety of products, not just latex gloves. For medical staff and patients, it is a big concern if an allergic reaction occurs. Latex itself, which is natural rubber, can be the allergen or the allergy causing factor, but in the case of powdered gloves, the cornstarch used in the powder can hold the latex, causing inhaled types of allergic reactions. The common symptoms of latex allergies include a rash that occurs after the latex comes in contact with the body. In some cases, the rash is mild, while in other situations it can be very severe and painful. Anaphylaxis can also occur, which can be fatal in extremely sensitive people. Less serious symptoms include irritation of the nasal passages, watery eyes, low blood pressure, and difficulty with respiration. How careful do I have to be about punctures and tears when wearing latex examination gloves? 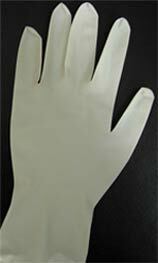 Latex examination gloves are considered to be very resistant to punctures with large objects or with flat surfaces. As they fit tightly to the skin the pressure on the skin with even a small to moderate sized object alerts the wearer to the problem before a puncture can occur. Tearing is very uncommon in these types of gloves unless a significant cut or puncture occurs in the gloves. The tensile strength of latex is above 3000 pounds per square inch. One caution when using latex examination gloves is the risk of puncture by very small or fine sharp points. These very tiny surfaces can cause a puncture that is not detected by the wearer and may pose a risk of contamination and lack of barrier protection for use in high risk work environments. Some of the newer types of gloves are designed to tear easily with even a small puncture, providing immediate options to change out gloves if any type of penetration by even a fine point occurs during a procedure. How close to real tactile sensation will I have when wearing latex examination gloves? One of the reasons that latex examination gloves are so popular both in surgical use as well as for standard exam gloves is because they are so fine and allow a high level of tactile sensation. They form completely to the skin's surface and do not remain stiff or hard, resulting in a very thin barrier between the surface object and the skin of the hand. For working with patients this is a perfect combination as you can feel the surfaces, easily grasp objects and move your hand as if you were not wearing a glove, yet you also have protection for yourself as well as the patient.